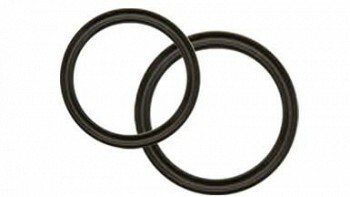 The O-ring is the most common type of fluid seal. An O-ring's simple design lends itself to a multitude of sealing uses, including static, reciprocal, oscillating, and dynamic applications at low speed and pressure. In elevated operating pressure environments, addition of a backup ring will greatly increase the extrusion resistance of an O-ring. The most basic shape of an O-ring is a simple circular sealing torus, usually made from an elastomeric material. Beyond the standard O-ring, All Seals can supply more advanced sealing designs such as Quad Rings®, which are specially designed for low pressure sealing. All Seals also offers O-rings in advanced materials such as Viton™, Viton Extreme®, and Teflon®. All Seals stocks over 200 million O-rings in 13,000 different size and material combinations. 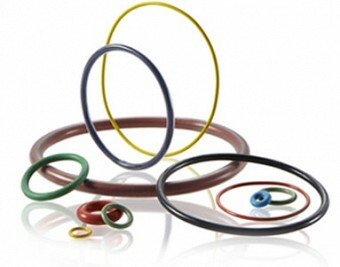 Quad Rings®, can be used in a wide variety of static and dynamic sealing applications. With the unique 4-lobe configuration, Quad-rings have 2 sealing areas per side as opposed to 1 sealing area on an O-ring. Quad-rings require less squeeze to maintain an effective seal; therefore, reducing friction and increasing seal life. Their 4-lobe configuration also helps to eliminate the seal from twisting in the groove causing premature failure. Quad Rings® have the same dimensions as the AS568A O-ring sizes, also referred to as standard size O-rings. Quad-rings are also available in other compounds to suit your particular application. Extrusion failure is one of the most common types of O-ring failure. When the internal pressure of an application becomes too great, the O-ring will actually extrude into the clearance gap. This extrudate will quickly be nibbled away causing a loss of material, and once sufficient material is lost, seal failure will quickly follow. There are three options to prevent this, the first of which is to reduce the clearances to lower the extrusion gap. This is obviously an expensive option, so a cheaper solution is to raise the durometer of the O-ring. Although, a higher durometer O-ring offers superior extrusion resistance, is often not feasible solution due to material availablilty, and to the fact that harder durometer materials have limited low pressure sealability. The last and best option is the addition of a backup ring. A backup ring is a ring of hard, extrusion resistant material such as high durometer nitrile, nylon, Hytrel, or PTFE. A back-up ring is designed to fit between the O-ring and the extrusion gap and prevent the extrusion of the O-ring. While back-up rings are used in conjunction with O-rings in both static and dynamic sealing applications, the gland they fit in must be specially designed to fit both the O-ring and the back-up.